This bolt-on-hoop kit includes 4 bent hoops, 8 plates, 16 bolts, 16 nuts, and 16 washers. 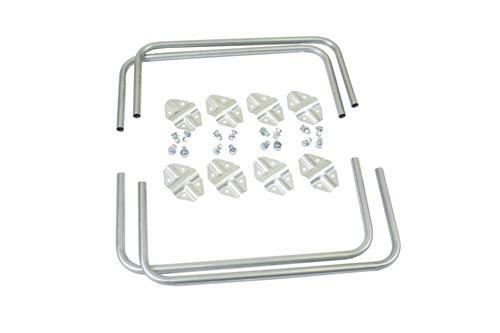 This kit will complete 1 load bar. Cargo Load Lock Bars (also called Paddle Bars) are great for helping secure your load and keep it from shifting inside your trailer. Hoops allow you to hold a larger area in place, great for if you have a bunch of different sized items. Hoops are 1” steel tubing and are approximately 28” wide x 12” tall.